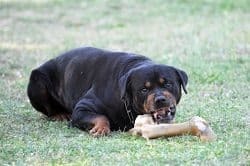 Are you thinking of bringing a Rotty home for the first time, or perhaps you have a Rottweiler that is showing aggressive behavior and you are not sure why? Maybe you have a new puppy and want to be certain of him or her growing into the kind and gentle dog that the breed should be? 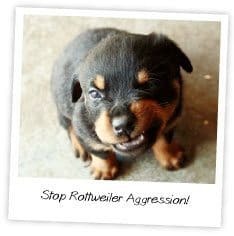 Well we can help, read on for an overview of Rottweiler aggression and what you can do about it. The Rottweiler can show a natural guarding instinct to protect his home and family, it is part of his genetic history. Unfortunately, the strength and power of this breed can make him potentially dangerous when put into the hands of an irresponsible or confused dog owner. Any Rottweiler will do what they are trained to do, so if you teach them that aggression is good behavior, even when you are unaware that you are doing it, it is easy to encourage the dog to show aggressive tendencies.Or, if you don’t give guidance and careful, positive training, your Rottweiler could turn into a challenging pet just simply from lack of training. Look out for signs of aggressive behavior early in your Rottweiler. The earlier you catch the behavior, the easier it will be to correct it and halt it from becoming a bigger problem in the future. Rottweilers are observers by nature. They may not react immediately when triggered. They will often quietly observe circumstances, and show discreet calming signals, finally reacting only if these signals are ignored. If you observe your dog staring or making a low growling noise, this is definitely a sign of aggressive behavior. You should watch them closely to see what it is that is triggering them to feel they need to act out aggressively. Before he growls the dog will offer a myriad of body language signs to show his unease. As a responsible owner of a big strong dog you need to know these signs. A common learned aggressive response is shown if a dog has learned to guard food. When it’s feeding time, does your Rottweiler become aggressive by growling, showing their teeth, or snapping their jaws at you when you approach them? If so, then you have a Rottweiler who has food aggression. Does your Rottweiler become aggressive when visitors come by? Then your Rottweiler may be territorially aggressive. You need to handle this dog very carefully. This is when owning a large and powerful dog can be very dangerous. Not only do you have to watch out for your guests, but you have to think about keeping yourself safe as well. A scared aggressive dog can easily redirect onto the nearest thing. It is vital that you learn to read your dog well before he gets to the stage of biting, then you can deal with the situation before it gets out of hand. Observe how they react to different stimuli when you are out taking a walk with them as well. If your dog becomes aggressive when they see another dog, then they are experiencing protective aggressive behavior. They may think they are protecting you from the other dog. This reaction could also be caused by a simple lack of canine social skills, it is important that you learn to tell the difference between the two. Fear can be a reason for aggressive behavior towards a certain trigger. Maybe it’s only men. Maybe it’s only women. 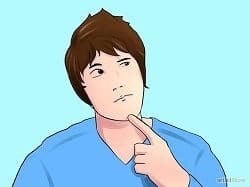 It could be that the person is wearing a hat, or has facial hair, this is usually a learned behavior based on an experience that has previously worried the dog or lack of good socialization. This is called fear or anxiety aggression. Fear is one of the biggest triggers of aggression. The scared dog often feels that he has no choice but to become aggressive, it is important to learn how your own dog shows fear. 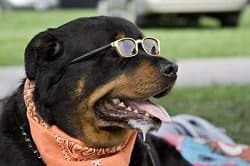 When you become aware that your Rottweiler is expressing aggressive behavior, it is best to try to neutralize the situation as quickly and calmly as you can. If you get upset and anxious when these situations occur, it will only trigger them to become anxious as well, only intensifying their aggressive tendencies. Exposing your dog to their aggression triggers in a controlled situation with a lot of attention paid to their reaction can help to ease them out of this behavior. When you can control the situation and neutralize it, those triggers will become less of a trigger in the future. . When you are taking your Rottweiler for a walk, it is important to develop social skills. Expose them to other dogs and people. If they show signs of stress remove them from the situation. When they become relaxed, make sure to give them great praise and attention. With aggressive behavior it is important to learn to read canine body language and cater your training around how your dog is feeling. If your dog is acting aggressively, never confront him, just walk away. Enrich your Rottweilers world with praise for good behavior. When they are raised with praise for passive behavior, they will learn that passive behavior has great rewards. A home life based around praise will ease your Rottweilers anxiety, make them feel secure, and can hopefully recondition them of their aggressive tendencies. To learn more on dominance read this article here. Before you do anything, there are a couple of things which you should NEVER do to an aggressive dog. This won’t help solve aggression and in many instances, it will anger your dog even more. Do NOT… pressure your dog when it’s in a stressed state. If your dog is growling at you when you approach it, don’t think it’s a good idea to get closer. When the dog is growling, it is warning you not to come closer or to stop what you’re doing. So respect your dog’s wishes. Do NOT… shout, yell or hit your Rottweiler. Your goal is to diffuse the situation, not to make things worse. Those should be your last options and should only be used if you’re under attack. If you feel in danger, try to remove yourself from the situation as soon you can. Exposing your dog carefully to the triggers daily, in controlled circumstances, will help to transition them out of their aggressive behavior. Most aggression is based around fear. Remaining calm and praising them for acting passively can help ease their anxiety. Starring and growling are actually the final signs of aggression in a long process, even if they have not actively bitten or lashed out, this could be the next evolution in your Rottweiler’s aggressive behavior. It is vital to learn about calming signals and signs of stress in order to read your dog’s body language like an expert would. Immediately remove yourself and your dog from threatening situations to avoid anyone getting hurt. Great article! It’s not always the dogs fault. Thanks Cathy! I totally agree. This is really great information that I have found applicable with other dogs with aggressive behavior. Socialization and familiarization is so important in dogs with aggressive tendencies. Thanks for the info! Thanks Kasey for stopping by. Glad you like it.